Oscillating Bearing is widely used in hydraulic cylinder, forging machine, auto damper and other machine. Because the outer spherical inlaid with composite material, so the bearing in the work can generate self lubrication. As a rule, rod ends are available with left or right-hand female or male threads. 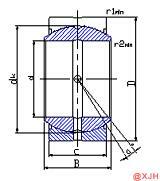 Oscillating Bearing is a kind of special structure of sliding bearings. The structure is simple than rolling bearing ,according to its different type and structure, can bear radial load, axial load or the radial, axial co-existing union load. Rings manufactured from hardened steel help deliver consistent, reliable performance. These Oscillating Bearing are designed and fabricated using quality components and material to ensure that final output meets with international quality standards. Also our products are in competitive price.